Star kids Janhvi Kapoor and Ishaan Khatter have successfully wrapped the shoot of their upcoming film Dhadak April 16, 2018. Daughter of late actress Sridevi was snapped outside a salon in Mumbai on April 18, 2018. Janhvi , who will soon be making her debut with the film Dhadak, was seen in neon shorts and white top. Some of the recent reports have said that the debutant will be joining Arjun Kapoor and Anshula Kapoor for a holiday in London. While Arjun and Parineeti will be shooting for Namastey England in London, sister Anshula along with Khushi and Janhvi will be joining in. Upcoming film Dhadak is a story about two teenagers who battle the rigid caste system in India. The film is a remake of the Marathi blockbuster flick Sairat which starred Rinku Rajguru and Akash Thosar. Dhadak will be releasing in theatres on July 20, 2018. 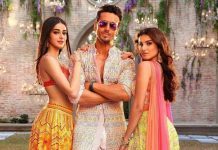 The Hindi remake is directed by Shashank Khaitan and is produced under the banner of Dharma Productions.